This Miata has an insatiable appetite for tires. Regular Motor1.com readers might recognize this curious car. We talked about it back in February, and yes, it’s a Mazda MX-5 Miata brandishing a 6.2-liter Hellcat V8 under the hood. Actually, the massive motor is too big to fit under the Miata’s hood, but as you can see in this latest video, it’s not too big to fit the confines of the Mazda’s engine bay. That is, without some extensive modifications to wedge the supercharged mill in there. Previous build videos from KARR on YouTube chronicle the progress of the bonkers engine swap, but the newest clip from Florida Car Culture shows the end-result, and what can be said that hasn’t already crossed your mind? A 707-horsepower Miata is well and truly capable of obliterating tires with reckless abandon, though to be fair, that engine in anything short of a semi-truck can atomize rubber with relative ease. This smoking demonstration took place recently at Bradenton Motorsports Park in Florida, and we do mean recently. 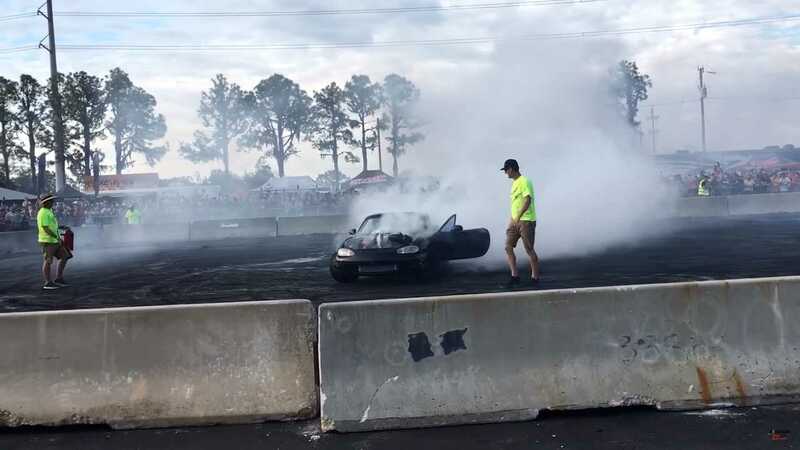 The first firing of the Hemi V8 was posted to KARR’s YouTube channel less than a week ago, so we’ll assume this burnout exhibition was the first major appearance for the FrankenMiata. The smoke show starts off a little slow, but then the driver hands over the controls to noted YouTube car guru and engine swapper Cleetus McFarland for some follow-up action. He doesn’t tread lightly on the accelerator, and by the end of the run, we’re not sure if smoke pouring from the engine bay is residual tire smoke or something a bit more dire. MX-5 engine swaps aren’t anything new. Since the sports car’s early days folks have dropped bigger mills under the hood and to be honest, even the torque from a mild V8 turns the Miata into a crazy smoke machine. Considering the 6.2-liter Hellcat offers up six times the power you’d get from a standard Miata, we hope the builder of this wild ride has a healthy stock of tires on standby.